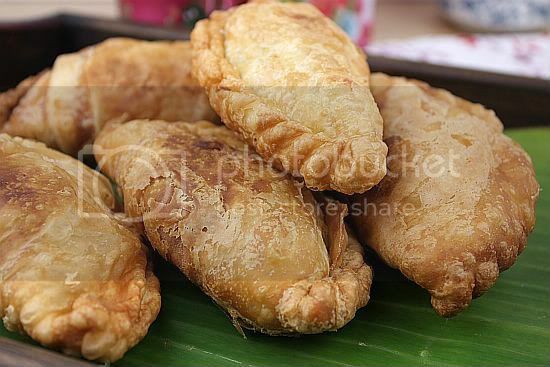 Curry puff is a very popular snack in Malaysia. If you ask a Malaysian if this is true, they probably would tell you "yes". This snack can be considered Malaysia's version of the empanadas. It was usually found in Malay and Indian food stalls. 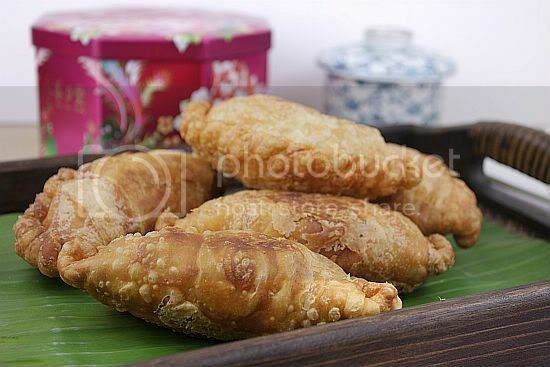 Another Malay version of this snack is known as epok-epok, which is a much smaller version of the normal sized curry puff. 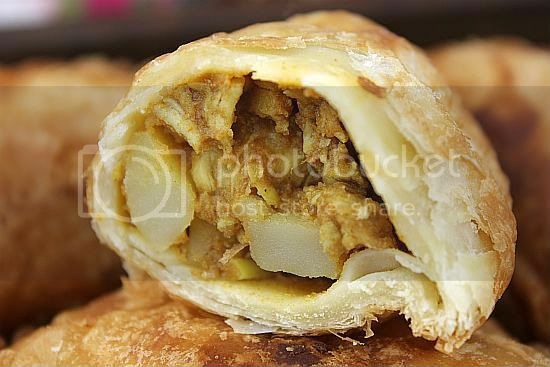 Epok-epok are filled with a half boiled egg instead of chicken and sometimes spicy tinned sardines are also used. (I love the tinned sardine version.) The curry puffs which are found in Indian food stalls are usually of the vegetarian variety, with filings such as spicy potatoes, carrots and onions. The popularity of curry puffs has taken such a huge leap that food manufacturers have now developed a frozen version of this snack. All you would need to do is just heat it up in an oven. However to me, there is still nothing like a freshly made curry puff. Boil margarine, water and salt. Pour into the flour. Add in egg. Knead well. Let dough rest for a while. Divide into 8 portions. Mix flour and lard/shortening together. Knead well and divide into 8 portions. 1) Wrap inner layer with outer layer. Flatten it and then roll it up like a swiss roll. Repeat twice and then divide into 2 portions. 2) With cut side on the table, roll dough into a circle and fill with a spoonful of curry filling. Wet the outer rim of circle and fold into half, seal the edges. 3) Puffs can be left to freeze and packed in ziploc bag when frozen until needed. 4) To fry frozen curry puffs, start them in cold oil. Remove several ladles of hot oil as the puffs are slightly brown, turn heat on to the highest and fry puffs until brown. This way will ensure that the puffs will not be soggy. 5) To fry the second batch, add in the slightly cool oil and put in the frozen puffs, frying the same way as above. 6) If you are frying immediately, heat up oil and then turn your fire to low. Add the curry puffs one at a time (do not over crowd). 7) Put fried puffs in 250F oven to keep warm. 1) Mix the chicken fillet with the curry powder. 2) Heat about 3 Tbsp of oil in a pan until hot. Add the onions and fry until slightly soften. 3) Then add the diced chicken and curry leaves. Fry for about 2 minutes, then add in the water. Cook until water has almost evaporated. 4) Then add in the potatoes. Season to taste and cook for a further minute. Leave to cool completely before using. Jo, curry puff is very very popular in Singapore too, you look at the queue during morning and evening at Old Chang Kee. I love curry puff and I like fresh curry puff, I can't resist when the curry puff just dish out from the frying pan, yummy! Wah! Your curry puffs look very yummy! The pastry and the chunky fillings is the real good one! It's one of my favorite snack! Haven't made curry puff for a long time. I absolutely love the pastry. So golden and flaky. Jo, any left for me! I love curry puffs! Oh Curry puff! Can I order some? This is one of my fave snacks too! love the generous potato and chicken fillings ... your curry puff a lot of "hao liao". Jo, you're right that I'd say kari pap would have to be a fave snack of the nation. Oh, I love the canned tomato sardine version too! I haven't had this in awhile! I should try making some myself! Yummy chicken curry puffs - a great snack for tea time. I'm making these for dinner this weekend - I cannot resist, they look amazing..samosas on yummy tseroids. I love a lot of filling and yours fits the bill!! Thank you for posting this!! These stuffed chicken curry wraps look incredibly wonderful & amazing too!